We are going to create modular and extendable ExtCore-based web application with data. 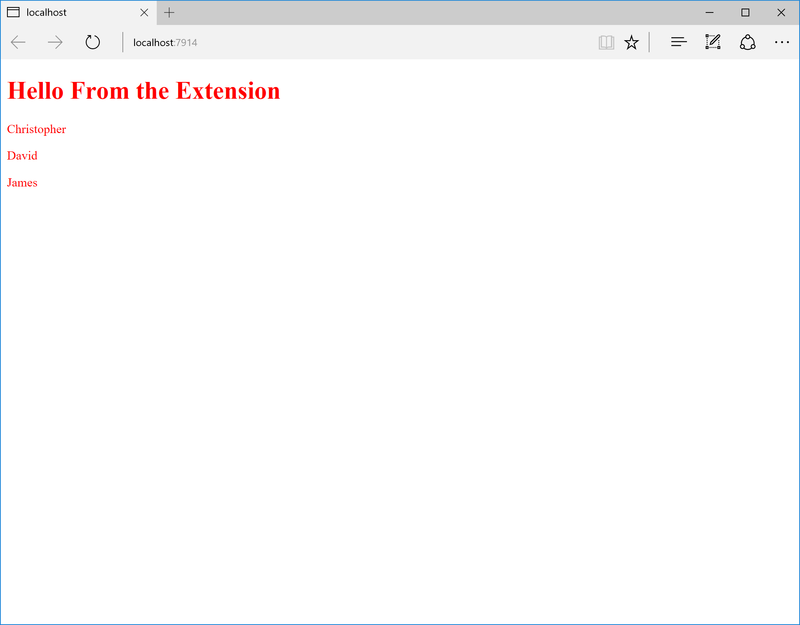 Please follow this tutorial to create ExtCore-based MVC web application first. We will use it as a base. So, we have the main web application and extension projects. They work but currently don’t know anything about data and storage. Let’s assume that we want our extension to display some data (the list of persons for example) from the storage (SQLite database for example) in its view. The ExtCore.Data and ExtCore.Data.EntityFramework extensions will help us to achieve that goal. of the supported storages; SQLite database support only in this case); * add logic for getting the persons from the database and displaying them. To be able to share entities among different projects (and following the ExtCore.Data extension design pattern) we will describe entity classes in the separate project. 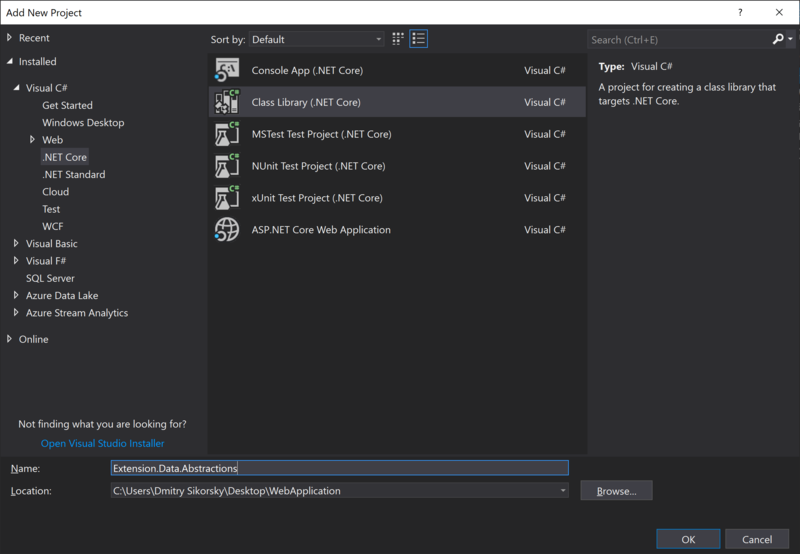 Open NuGet Package Manager and add dependency on the ExtCore.Data.Entities.Abstractions version 4.0.0 package (be sure that Include prerelease checkbox is checked). ExtCore.Data extension implements Unit of Work and Repository design patterns. It means that all the work with the storage is performed in a single context, and it also means that every entity has its own repository that contains all methods you need to work with it. Repositories when created are resolved automatically, so everything we need to do is to create corresponding repositories. To be able to share repositories among different projects (and following the ExtCore.Data extension design pattern) we will describe repository classes in the separate projects (one for abstractions and one for each of the supported storages). Open NuGet Package Manager and add dependency on the ExtCore.Data.Abstractions version 4.0.0 package. Also add dependency on your local Extension.Data.Entities project. Open NuGet Package Manager and add dependency on the ExtCore.Data.EntityFramework.Sqlite version 4.0.0 package. Also add dependency on your local Extension.Data.Abstractions project. Now when we have everything we need to work with data and storage let’s display the list of persons in the view. First of all create the SQLite database with one Persons (pay attention to the case of the characters) table and few rows. You can use SqliteBrowser for that. Finally, open NuGet Package Manager and add dependencies on the ExtCore.Data version 4.0.0 and ExtCore.Data.EntityFramework.Sqlite version 4.0.0 packages. Add dependency on your local Extension.Data.Abstractions project. As we can see, data from the database is displayed. You can find the complete source of this sample project on GitHub: ExtCore framework 4.0.0 sample web application that uses a database.